When my daughter was young she was a stuffed animal fanatic. These are three of them that I pulled out of her permanent archive. I thought that it would be an interesting challenge to see what I could do with the subject. One of my goals was to not make it too cutesy, but I also did not want a creepy painting either. In the end I really like the painting. I hope that you enjoy it! Flowers And Silver 6 in. x 8 in. 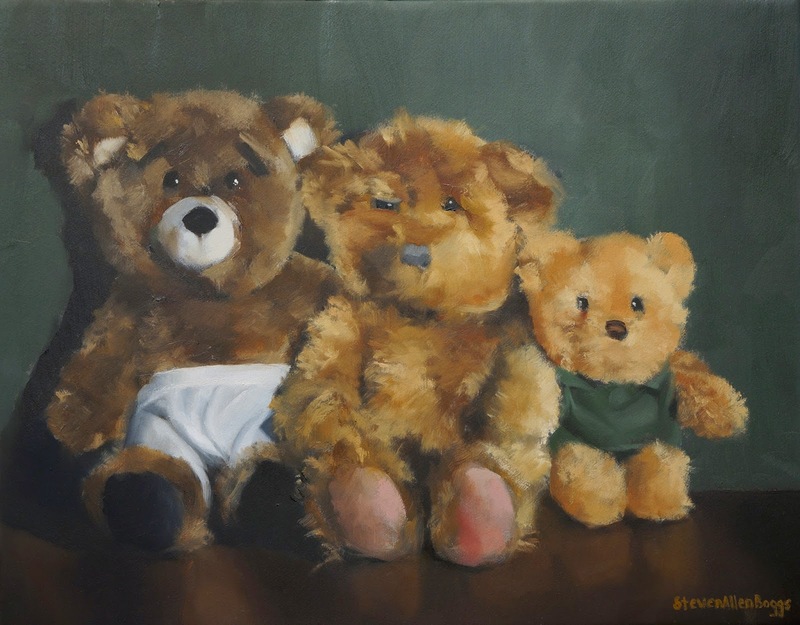 Oil On Linen On Panel - $91 Starting Bid. 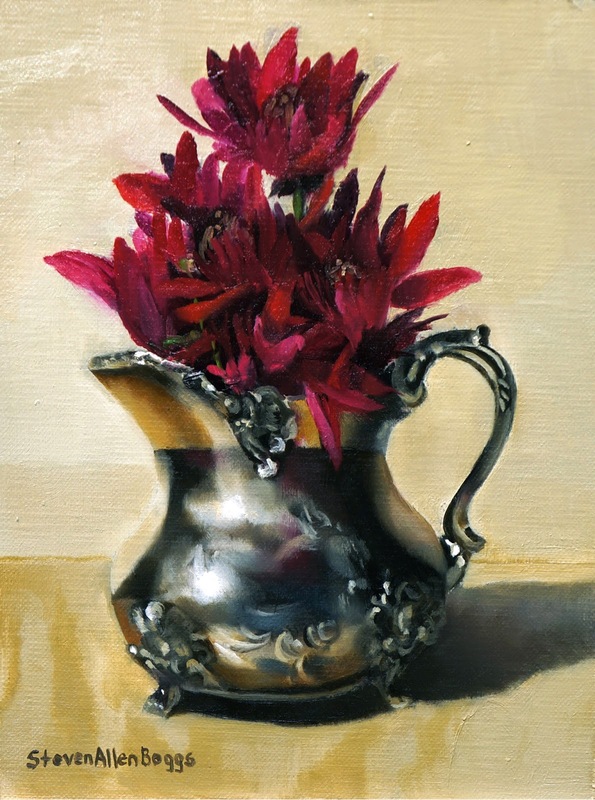 For me this painting is about the silver creamer and the color contrasts of the flowers and wooden table top. 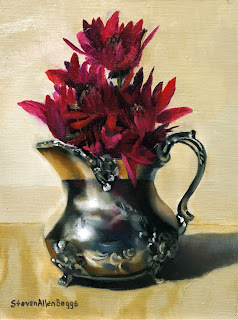 Silver and metal objects are one of my favorite things to paint. This one took a little time to finish because of the need to paint in layers to get the effect that I was after on the creamer. In the end I really like the result and enjoyed creating the painting. I hope that you enjoy it. This is an antique silver ladle that my wife has with three plums. 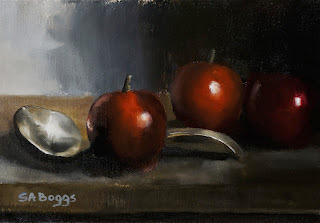 I always enjoy painting shiny metal and I thought that the deep red of the plums made a nice contrast with the shine and colors in the ladle. 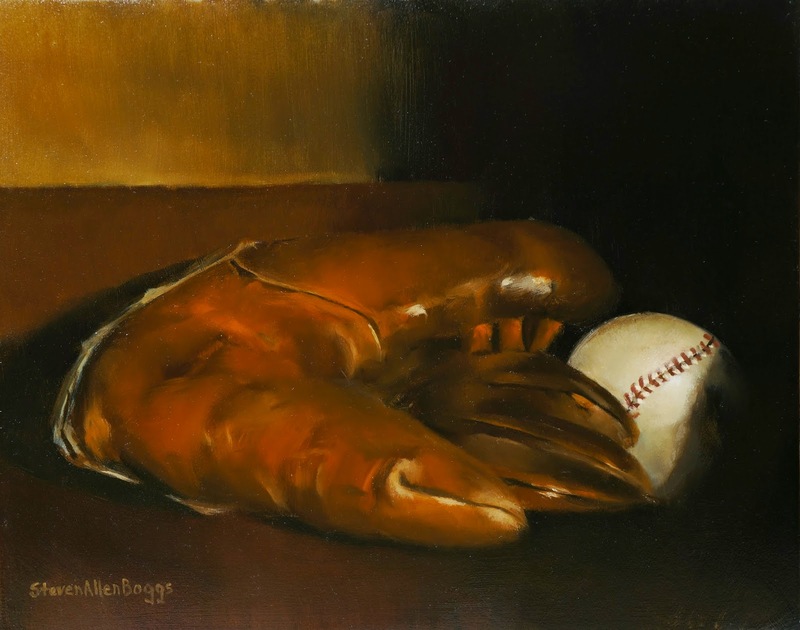 I hope that you enjoy the painting. This was my father's baseball glove from when he was a kid. It is a 1936 Joe Gordon Model 4205, It still has my dads name and address written in ink on the wrist strap by my grandmother. Pretty cool in my opinion to still have this and to be able to paint it. I hope that you enjoy it! This is my first posted painting in a while so I thought I would start out with rather familiar subject matter for me. 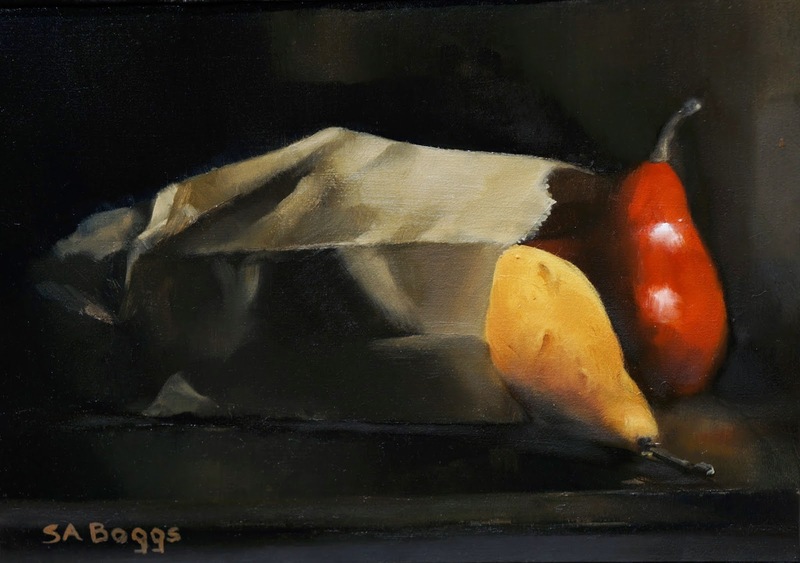 I've painted pears many times and in this instance I really enjoyed painting the golden yellow and red colors of them. Paper is always a challenge to paint. I hope that you enjoy it! This is a group of wild flowers along the loop road at Cades Cove in the Smoky Mountains. This valley in the park is an incredibly beautiful place, the whole area is full of amazing flowers, plants, wildlife, etc. 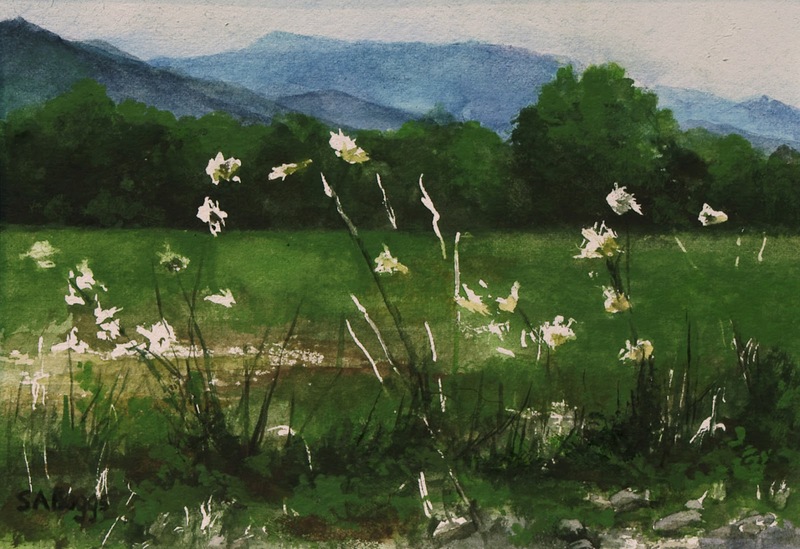 I thought that these kind of run-of-the-mill white flowers by the gravel road had an interesting pattern to them with the mountains in the background. I hope that you enjoy the painting! 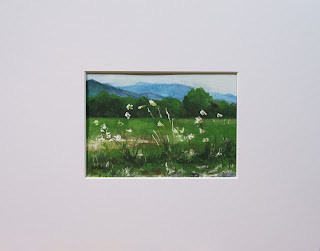 With 'Rythmn (Wild Flowers At Cades Cove)' the artist reserves the print and reproduction rights to the painting. 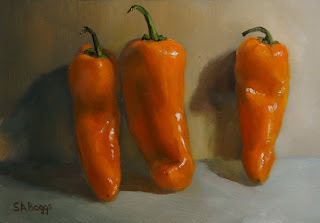 These are three orange peppers against a wood panel. I thought that they looked somewhat like people, maybe a couple with the guy on the right left out. I really liked painting the variances in the orange tones on the peppers. I hope that you enjoy the painting! With 'Only The Lonely' the artist reserves the print and reproduction rights to the painting.